It was pitch black outside as the old rail cars jolted to life with a groan. Then another jolt and a subtle and quickening clack, clack, clack as the Santa Train left the Shelby Yard in Pike County. Mary Hughett came from Bristol, Virginia, with her 2-year-old son Aiden, and followed the train, stop after stop, from Shelbiana, in Pike County, Kentucky, to Dungannon, in Scott County, Virginia, collecting gifts along the way. “This has been the worst year,” said Hughett, a single mother who has struggled to pay bills. “We’ve hit rock bottom. Without the Santa Train, she couldn’t give presents to her son and others who otherwise wouldn’t have much of a Christmas, said Hughett, as she stood, her arms loaded down with a coat, toys and other gifts. Past Garden Village and Justiceville, the train rolled. Clack, clack, clack. “It’s a tradition,” said Reanna Adkins, who waited in the dark of Marrowbone, Kentucky, as volunteers waded through the crowd with bags of gifts. Santa stood on the back platform of the West Virginia, the 65-year-old hospital car that serves as his sleigh, and tossed stuffed animals to the crowd. “I’ve done this since I was a little kid, and I wanted to bring my daughter to see it,” said Adkins, who has since moved to Georgetown, Kentucky, three hours away. It was 6:25 a.m. and Chloe, 3, nestled in her mother’s arms, looked tired and may not have understood what was going on around her as volunteers gave out color-coded backpacks and toys and rolls of wrapping paper. The stop lasted only 15 minutes. Two toots of the train whistle and the volunteers scrambled back to the train. “They will leave you,” Leslie Higgins, the manager of crisis and event planning for CSX, told volunteers the night before at an orientation and appreciation dinner at The Social, an events center along the train tracks in Kingsport. Past Road Junction and Draffin and Belcher. The Santa Train tradition began in 1943 when Flem Dobyns decided he wanted to thank the folks in the region who traveled through the mountains to buy implements of their life from his hardware store in Kingsport, Tennessee. That year, a group of businessmen boarded the Clinchfield Railroad’s passenger train near Shelbiana and rode it home, tossing candy off the back of the train to kids along the way. When the Santa Train started, World War II was raging and the coal industry in Appalachia was booming, said Gurney Norman, a longtime professor in the Appalachian Studies Program at the University of Kentucky. He estimated that there would have been more than 100 coal mines operating in a small sliver of Virginia where the Santa Train runs. 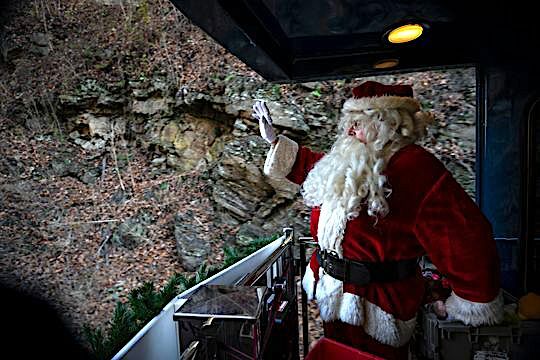 But the coal industry began to decline, and over the years the Santa Train has gone from giving away candy to the kids, to providing the only toys and gifts some of the children will receive, he said. Past Dunleary and Cedarville and into Elkhorn City. It was 7:05 a.m. and the sun was coming up. Clack, clack, clack. “Lots of good boys and girls in the crowd,” shouted Ted Marquis, who works for City Year, a non-profit group out of Boston, Massachusetts. Marquis was working the train for the ninth year. At each stop, he shouted instructions, especially for the first-time volunteers just before they exited the train — things like “Don’t give out gifts until you get away from the train.” And then he finished his speech shouting two final words. “Santa Train!” the volunteers responded. And they were off, climbing down the steps of the New York, CSX’s most historic passenger car, which was altered to have an extra-large rear platform that could accommodate Franklin Delano Roosevelt’s wheel chair. Barbara Tackett waited with a large black garbage bag to collect whatever the volunteers handed her. It’s been a rough stretch for Tackett’s family. Her husband, who used to install double-wide trailers, has been out of work for six years and there’s really not many jobs to be found, said Tackett, 65. The poverty in Pike County was 23.4 percent in 2013, the last time the U.S. Census Bureau measured it. Hattie Duty was there to get presents for her 5-year-old daughter. The doll and stuffed animals she held in her arms, and whatever else she collected, would likely be the only presents the girl would get this year. “I have no income,” said Duty, who is 40. “I ain’t got no job and her daddy had a massive stroke,” she said. Two more whistles and the volunteers clambered over the ballasts, the big rocks along the tracks, and back up onto the train. Some CSX workers who trailed behind the train would stay and distribute even more toys, food and coats at each stop. The train rolled into Virginia and made a quick stop at Toms Bottom and then through the Jefferson National Forest, past Barlick. Along the way, Don Royston stood on the back platform of the train and waved. In real life, he’s a retired CPA. On one Saturday a year, for nearly 20 years, he’s Santa Claus. People wait in their backyards, on their front porches and along the tracks to get a glimpse of him. He never leaves his post. It used to be that Santa chucked toys and candy off the train to folks on the tracks as it chugged along. It’s been years since CSX stopped that tying to limit liability. At first, the old Clinchfield Railroad partnered with the Kingsport Merchants Bureau to sponsor the Santa Train, and then it was Seaboard System after it swallowed up Clinchfield in 1982. CSX Transportation has carried on the tradition since 1986. Higgins said it’s impossible to know how many people benefit from the Santa Train, and she doesn’t know how much money CSX spends each year to pull it off. The main sponsors of Santa Train, in addition to CSX, are the Kingsport chamber of commerce, Food City grocery stores, Appalachian Power and Soles4Souls, a Nashville-based non-profit that provides clothing and business opportunities for poor people here and abroad. At Haysi, Tackett was back. So were Darla and Rick Stacy, who had also been at the previous stop. 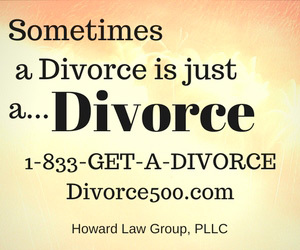 She’s a stay-at-home mom; he’s a “retired” strip-miner who wants badly to go back to work. There wouldn’t be much of a Christmas at their house without the Santa Train, Darla Stacy said. Laura Phelps, a spokeswoman for CSX, said it’s not odd to see the same family at stop after stop. “We don’t ask any questions,” she said. The train crept along at no more than 25 mph. It rolled along the McClure River, past the towns, if you can call them that, of Steinman and Tenso. When the train arrived at Clinchco, a crowd had gathered at the small crossroads. It was 8:40 a.m.
Amber Willis and her boyfriend, Jelane Mock, and their two children were among the crowd. She’s a social service worker for Dickenson County, Virginia, and has been coming since she was 13. He’s an Army veteran who works at Food City, one of the Santa Train sponsors, and has been coming for 25 years, since he was 5. “It’s just tradition,” he said. At the next stop in Freemont, Michael Scarberry, 48, brought his daughter and granddaughter and a family friend. He stood holding coats the three had received from some of the 120 volunteers who walked through the crowd. Past McClure and Stratton and Trammel, to Dante — pronounced not like the poet but like “Dant” or sometimes “Daint’ — where a crowd has gathered. At 10:30 a.m., there was still rime on the crossties and the grass and weeds along the tracks. As you travel along the route, the local economic conditions gradually improve. There seem to be fewer mobile homes with rusted roofs and more stick-built homes that are larger and in much better shape. Past Morefield and Boody to St. Paul, where a huge crowd, the biggest of the day, is waiting. Becky Slote was there wearing a red Christmas sweatshirt with snowflakes on it. She wasn’t there for gifts or wrapping paper or coats or anything like that. The train, rolling through the Clinch River valley, passed the crossroads of Burtons Ford and Carfax and Bangor and stopped at Dungannon. The train, an engine and 12 cars, rolled past Clinch and into Fort Blackmore. It chugged along the Clinch River, past Rhoton Mill and Clinchport and Speers Ferry and into Kermit, the last big stop for the Santa Train. Three generations of the Shepard Family greeted the train there. Donna Housewright Shepard, 60, lived just up the hill from the tracks when she was a child. “We’d be in the barn grading tobacco and we’d hear that train whistle and go running down the hill,” she said. Back in those days, Santa would toss out candy and note pads as the train roared past, and she and other children would scramble to find candy on the ground. Last week, she came with one of her sons and her grandsons. Braydon Shepard, 9, a stocking cap pulled over his ears, bounced in excitement over the backpack and Adidas water bottle and toys — so many that he needed help holding them. There was a final, quick stop at Waycross on the Virginia-Tennessee line, where the last of the toys and the gifts were handed out, and then onto Kingsport, where there was a huge party expected to attract 5,000 people. The Santa Train tradition has gone on for 76 years now and has continued even as CSX considered shutting down the Clinchfield road a few years ago as the downturn in the coal industry meant fewer hopper cars coming out of the mountains. The industry has stabilized now, Higgins said, which suggests the line will remain open at least for now, and Santa’s train will continue to help the people of the region. “I’ve been told we would run this train as long as a railroad track runs through here,” Higgins said.